Vietnamese (Lunar) New Year Custom for Westerners. To many Western and Vietnamese people, it is hard to tell when East Asian Lunar New Year (“Tết Âm Lịch” in Vietnamese) will come. To add to the confusion there are also different New Year days for its neighboring East Asian countries like China, Korea, etc… When the Festival comes they are again surprised at the activities or inactivity! This blog helps them understand the festival and know the custom to plan their activities to avoid any inconvenience. In short description, the traditional New Year Festival (“Tet” in Vietnamese) is a period of long holidays and prolonged shut downs of normal trading. The details are explained in the following. 1. When is a Vietnamese New Year Day? The first new Lunar month after Winter Solstice is always named the Final Month (“tháng Chạp” in Vietnamese; the name may come (?) from the word “tháng LẬP Đông”). The end of that month is the Lunar New Year. Neighboring Asian countries (China, Korea) all use this rule but the New Year day of each country may differ by one day or sometimes one month due to their different time zones . All months here denote Lunar months unless otherwise specified. Month are name Month 1 to Final Month and there may be 13 months in a Lunar Year with the Leap Month bearing the name of its preceding Month appended with the word “Leap”. Note that the Final Month may be either a 12th month in a non-leap or a 13th month in a leap year. 2. What are the Vietnamese New Year Holidays? Seafaring Vietnamese people finish their fishing activities before the stormy season (Stormy seanson in Central Vietnam extends over months 9,10,11 and Final month of Lunar Year.). Agricultural Vietnamese people in the countryside finish their harvest before Winter Solstice. So the Final month of a Lunar Year is ready to be a time for preparation or enjoyment of New Year Festival. The Festival holidays may begin in the Final Month and continue through Month 1, 2, 3, 4 (“tháng Giêng, tháng 2 3, 4” in Vietnamese), If there is any leap month falling between Month 1 and Month 4 then the holidays are also extended by that extra month. Agricultural people have to come back to their work on Lunar Month 4. Since Lunar Month 2 the sea becomes calm and fishermen can resume their work. Vietnamese fishermen are most busy when the star Arcturus Bootes is shining (Note that Arcturus Bootes is a star of the night on April 25th; it is called “Sao Một”, top ranked star, by Central Vietnamese people). 3. What are the activities in Vietnamese New Year Festivals. a. Food and drinks are to be stored up to the brims of containers in each household (to make a wish of having prosperity for the coming New Year.). Food and drinks are supposed to be adequate for all requirements of the household for more than two months. “Tết” can also be considered a practice run for survival in disasters, for that Vietnam has had many). The concept of “just in time” does not apply here. 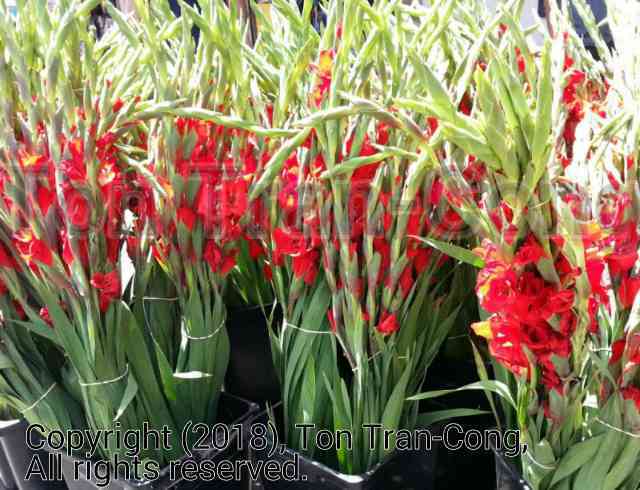 Prices are outrageously higher in some areas including Saigon (up to 10 times higher when buying from traders originating from Northern Vietnam) in the month long New Year Festival period. b. Most trading activities (including non-emergency transportation) are to cease from New Year Eve to the 10th day of First Month . Everyone is provided with an opportunity to come back to his or her home town for Family Reunion. People already in their home town are also provided with a practice run for survival with reduced transportation and without trading. Transportation people expect to be showered with 100% to 200% tips. 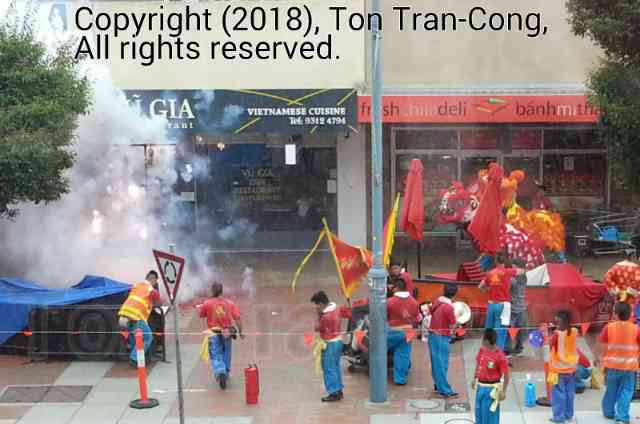 Example: During Tet Festival, economy class return air tickets by Vietnam Airlines from Melbourne to Saigon may cost AUD1500/person (too high?) while an economy class return air ticket on Thai Airway from Melbourne to Bangkok may cost only around AUD600/person. So your own transportation is almost basic essential. c. People from distant places may have additional holiday time to travel to their home town and back. Boat travelers may need encompassing full Moons to travel by rivers, canals to their home places. d. All houses are to be cleaned up and decorated to celebrate the New Year. This activity commences early and does not end until New Year Eve. Houses and monuments are to be decorated with whole trees or cut branches of “cây mai” (Ochna integerrima or Ochna) which have been made to blossom flowers on the First day of New Year. e. Food, preserved food and offerings are to be prepared to Festival days. Vietnamese food for New Year includes “bánh chưng” (steamed cooked loaf), “bánh dầy” (thick loaf), “bánh tét” (loaf that can only be cut by Splitting its wrapping made of banana leaves). “xôi vò” (rolled and squeezed sticky rice), “cơm rượu” (fermented cooked sticky rice) , “rượu đế” or “rượu nếp” (Vietnamese distilled alcoholic spirit made from fermented cooked sticky rice), “rượu nếp than” (Vietnamese distilled alcoholic spirit with the colour of charcoal, made from fermented cooked purple sticky rice). “tôm khô” (dried salted prawns), “khô mực” (dried salted squid), “củ kiệu ngâm dẩm” (pickled leek bulbs in vinegar). f. Permanent Indoor Altars are to be decorated with white or red lilies (“hoa hụê” in Vietnamese). Incense and candles are to be lighted on altars. 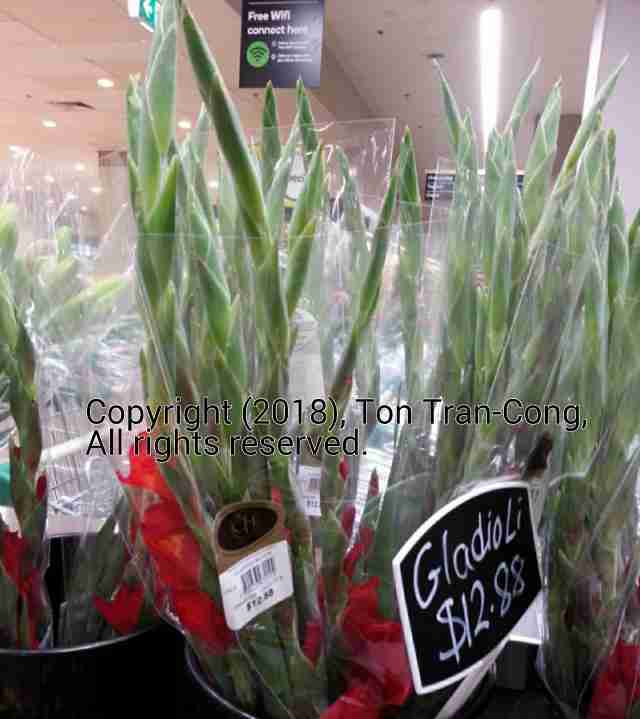 Figure:Lilies from a Vietnamese stall in Melbourne at AUD 15/bundle. Figure: Gladio Li from a Big W Supermarket in Melbourne at AUD 12.88/bundle. 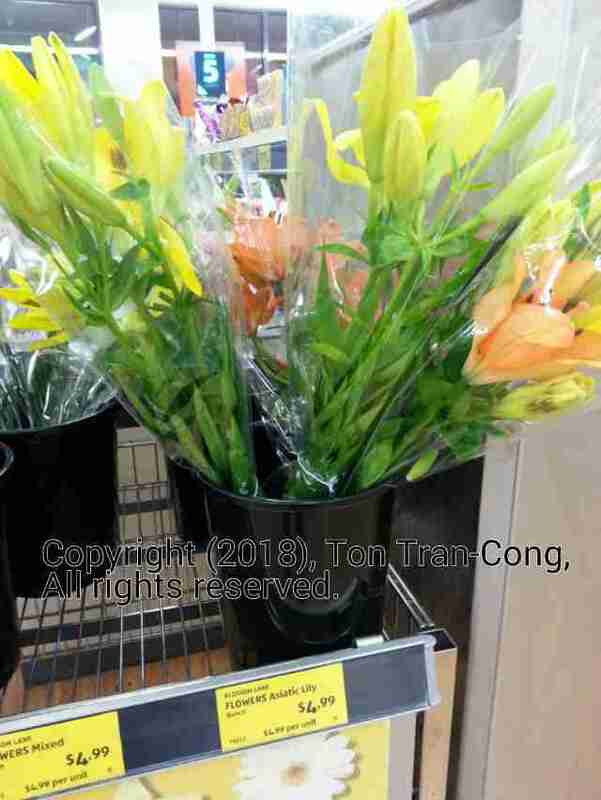 Figure:Lilies from an Aldi Supermarket in Melbourne at AUD 4.99/bundle. g. On the 23rd of Final Month, people have to make Farewell Ceremony for Three Inhouse Monitors from Heaven (“Hai Ông Một Bà Táo” in Vietnamese; they resides in the family earthenware stoves and have charred, blackened, faces). The three Inhouse Monitors from Heaven work similarly to real life Resident In-house Monitoring Agents of Ward Police (Ward Police = “Công An Phường” of current Socialist Vietnam; a ward is a subdivision of a district which, in turn, is a subdivision of a town or city). They leave the household riding 3 carps (not submarines!) 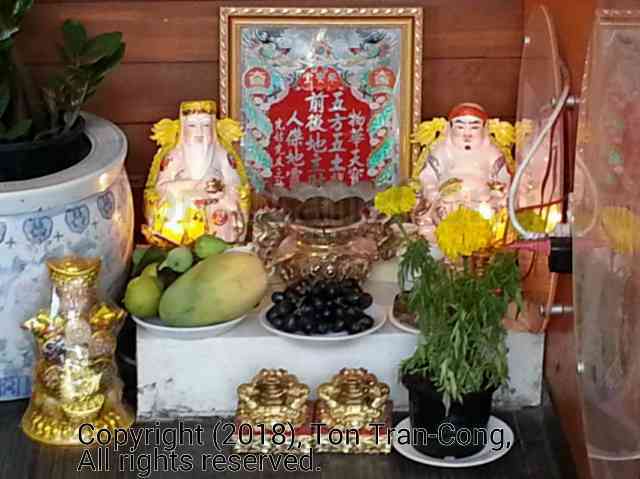 to go to report to the Jade Supreme God of Heaven (“Ngọc-Hoàng Thượng-Đế”) of all the good and bad deeds of the household from the first day to 23rd day of final month of the preceeding Lunar Year. i. Without the Three In-house Monitors from Heaven all activities in the household are now off-the-records! j. Good-time boys and good-time girls now may do non-righteous things without worrying about having bad records made in Heaven. Some people from Northern Vietnam takes this off-the-record time to do go out eating dogs! k. On the last day of Final Month a temporary Altar have to be made and placed on top of an upright long pole for the Deceased Ancestors to reside (the assemblage is called “cây Nêu” in Vietnamese) and enjoy New Year celebration with their living descendants. l. From Sunset to New Year Commencement at midnight, people have to make Welcome Ceremony for new Three In-house Monitors from Heaven (“Hai Ông Một Bà Táo” in Vietnamese). The new Three Monitors have been rotated by Heaven from some other household to ensure equality and impartiality. m. All good and bad deeds from people in the household are from now observed and recorded again by new Three In-house Monitors until they in turn depart near the end of the current Lunar Year. o. Incense and candles are to be lighted on the small Altar in the front yard for the Jade Supreme God of Heaven (“Ông Thiên” or “Ngọc-Hoàng Thượng-Đế”). This altar for the Supreme God does NOT have any statue, drawing and no more than the words “Môn-Khẫu Thiên-Địa” (The doorway to Heaven and Earth”). p. Incense and candles are to be lighted on the small Altar on Ground Surface for the local Custodian God of the local Land (“Ông Địa”). People from North Vietnam now have the local Custodian God of the local Land sharing his altar with the White Eyebrow God (“Thần Bạch Mi”), the Patron God of Prostitutes. Figure: Custodian God (having big fat belly) of the local Land sharing an altar with White Eyebrow God (having white eyebrows) . Note that the White Eyebrow God (“Thần Bạch Mi”) is totally different from the God of Lucks (“Thần Tài”), who rides a horse and wears an Imperial Court Administrative Official suit with WINGED Head Wear. The God of Lucks is usually depicted with a gold colour dress with black circular emblems, with the motto “Kim Ngọc Mãn Đường” -a court yard full of gold and precious jewels- ). q. Midnight comes. This is the commencement of New Year. Trading (buying and selling) is a taboo for the next 72 hours. Higher prices are expected both before and after this 72 hours period. r. New Year Celebration begins with detonation of fire crackers to scare away any bad spirits. This is just like scaring away robbers and bandits during any change of guards. Figure: Two Fire-crackers chains (in red colour) are hung from the ceiling to the ground. They are carefully guarded before they are burnt. Figure: Fire-crackers make crackling sounds and flashes. 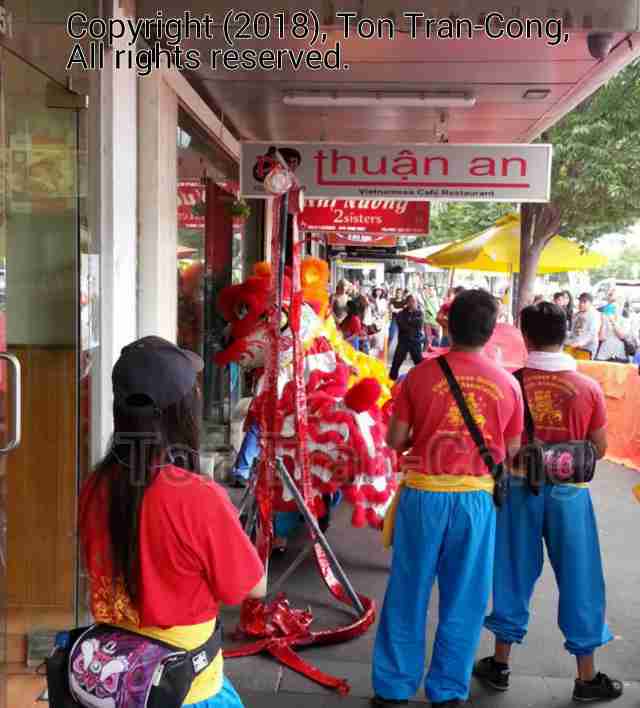 This Lion Dance is on the third day of New Year (2018Feb18z) in Sunshine, Victoria, Australia. Identical firecrackers are burnt in traditional Celebration at commencement of a Lunar New Year. s. People make offerings to their ancestors at the indoor permanent altars for ancestors. t. People go to Pagodas to break and take home (vandalize?) any of blossoming branches of “mai” trees there (“Hái lộc”). u. First day of New Year is for Family reunion. Note that married women are considered family members of their husbands and not of their maiden family. v. Second day of New Year is for Married Women to come back and reunite to their maiden families WITH their husbands and children. w. Third day of New Year is for visit to former Teachers and people who brought/made working people to their current status. x. Fourth day of New Year: People can enjoy their own chosen festival activities. y. Seventh day of New Year: The temporary Altar (“Nêu” in Vietnamese) have to be dismantled and Deceased Ancestors are sent back to their Heavenly place. Some shops may reopen on the Eighth day of New Year. z. First Full Moon of New Year is “Hội Trăng Rằm” in Vietnamese (Carnival of Full Moon, “Tết Nguyên Tiêu” in Chinese written literature/history). People go to Pagodas to pray and make offering. Unmarried people go to the Carnivals of First Full Moon to select their matches (as described in the folk song of “Hát Hội Trăng Rằm”). aa. New Year Festivals close. People relax to enter Month 2 for leisures. Prices of good fall back to new levels which are not necessarily the old level. The high prices during the Festivals have been their stress-tests. Traders have evaluated supplies and demands during those tests and will confidently apply their new prices!
. tonytran2015, When-is-lunar-new-year-khi-nao-la-tet-am-lich , posted on 2018 January 1st. thank you for linking my post about chinese new year. recently, i’ve been a lot more interested in vietnamese culture, so your post was fascinating to read, and i think i learned a lot from it! Thank you for adding my link for South Korea! I did not know that about tipping because the workers are there so you can travel… it is amazing how similar but different Asian countries are about this holiday. I have made my own method of reblogging by using the chain symbol in the desk top editor by WordPress but the method is too complicated. Thank you, Ace Friends & Bloggers News, for re-blogging. Thank you, Brittius, for the link.